​Sweetest doe kid of 2016. Extremely dairy, milks out with the softest udder texture of the whole herd, gorgeous soft fine coat, a pretty little doe! Sweet Honey Bee x Heartbreaker 4/13/2017 Gold/White doe kid. A lovely golden doeling with an appropriate golden heart on her side in honor of her sire, Heartbreaker. 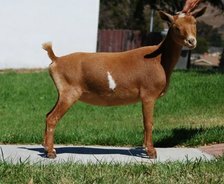 She is a growthy well built doeling with a beautiful face and nice spring of rib. She isn't as wide in the muzzle or rump as her buckskin sister, but is very nice & growthy. Hetland Creek Play It Again - "Baby"
​We lost our beloved "Baby" in a freak & extremely fast case of bloat, she was gone within minutes of her first signs of anything amiss. I was literally playing with her just before feeding that pen. Extremely fast acting, like nothing I've ever seen before, I didn't even have time to run for help or supplies, within minutes she was gone. She was our special "Baby" and an OUTSTANDING doe and mother. Her loss is HUGE for us both emotionally and in the herd. Our family was incredibly attached to this special doe. Sweet Honey Bee x Heartbreaker 4/13/2017 Buckskin/White doe kid. A lovely little kid, smaller than her golden sister, but I love her broad nose, wide eye set, and continuing width through her rump. Had her listed for sale, but just don't think I can part with her. Something tells me she's special. Pholia Farm HB Macy Marie +EE+ 85 - "Macy"
Notes: Macy has gorgeous blue eyes & is long, sharp, & dairy. Nice legs & pasturns with good feet. Her 1st freshening udder is looking nice & has wonderful large teat size & great placement! I'd like to see higher rear udder & softer udder texture. Her 2nd freshening udder in 2013 is MUCH improved! Very improved in capacity and udder texture!. Very easy to milk. Another benefit is that she always produces the sweetest, gentlest kids ever!! *Update - Macy has skin cancer on her white tail area and 2016 will be her last pregnancy, before retiring here. 5/2/2011 - twins/1 doe retained, "Melody"
5/28/2013 - twins/2 doe's, 1 doe retained, "MiMi"
2015 Yamhill County Fair - 1st Place Sr Doe, Best of Breed Nigerian, Overall Best Doe in Show!! ​2013 LA: +EE+85, Macy kidded this year with a tough case of Mastitis (which we got cleared up later on) but she was scored accordingly due to this illness. The appraiser was still very happy with her and said she also had excellent rear legs & angulation! ​Notes: Angel fell off the radar after being sold as a kid. I was told she placed 1st in her class as a First Freshener. I've been told she has regularly had triplets & quads just like her momma. Summer of 2016, a wonderful lady found her and contacted me about buying her back & I jumped at the opportunity to bring a beloved Deco daughter & Peggy Sue daughter into the herd! And I am ever so happy that I did! She was weaning her last bunch of kids when I got her back so I can tell she has lovely high escutcheon, nice huge teats just like my other Deco daughters, lovely texture, great capacity. And I am happy to say that her body is the perfect blend of her momma & her daddy and I'm just beyond thrilled! Positives/Negatives: Goal is to always breed her to bucks that genetically should produce larger teats and improved sharpness/corrrectness of shoulder assembly. Positives: Exceptional body capacity, perfect rear leg set/angulation/width, perfect feet & legs, beautiful head & ear set, long lean neck, exceptionally long bodied, impressive overall width & body capacity. Beautiful mammary system w/impressive medial, high wide rear udder, nice foreudder, and amazing capacity! INCREDIBLY HEAVY MILKER! ​Click here to see Peggy Sue's ADGA Linear Appraisal page. 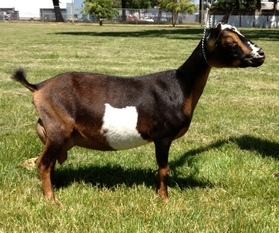 2013 LA: VEEV 89 -- scoring "Excellent" in Head, Rear Legs, Back, Dairy Character, and Body! Our appraiser was ecstatic about our Peggy Sue! Just LOVED her! Said she had ideal rear leg set, rear leg angulation, and width! Not to mention an amazing mammary system! Alethia CRC Ophelia 5*M FS +EEE 89 - "PhiPhi"
Goals: Goal is to breed her to bucks that genetically should improve shoulder assembly & overall width of body & substance of bone. Positives: Nice rear leg set/angulation. Beautiful head & ear set, long lean neck, long bodied. EXCEPTIONAL mammary system w/high wide rear udder and AMAZING capacity! She has beautiful medial, impressive large perfectly placed teats, and wonderful texture! Negatives: Needs improved shoulder assembly & more substance of body, overall body width. Also could use a smoother, more extended foreudder. I cannot believe it, but we lost Tater in a freak accident October 2016. To say she will be greatly missed is a huge understatement. She was a quirky, cranky, sweet & lovable girl who loved (demanded!) her head rubbed, would try to bite you if you made her do anything she didn't want to do (or didnt rub her head when she asked), and who had such an incredibly bright future in the winners circle. She is irreplaceable and has left a void in the herd and in our hearts. Her daughter Beach Bunny and her 2016 doeling Gidget will remain here in an effort to follow in her footsteps; they are the only daughters she ever had. RIP my quirky lil Taterbug. Positives/Negatives: Goal is to always breed her to bucks that genetically should improve sharpness/corrrectness of shoulder assembly and upstandingness at the withers. Positives: Impressive body capacity & overall body width & depth, great rear leg set/angulation, good feet & legs, nice head & ear set, long lean neck. beautiful mammary system w/impressive medial, high wide rear udder, nice foreudder, and amazingly huge teats!! Negatives: Needs improved shoulder assembly & possibly smaller teats (Crazy right!?!? But they almost dont fit in the milker!). She is also on the shorter/wider side. Bellafire CB Macy's Milky Way - our beloved 'broken legger' :-) "MiMi"
Beautiful, sweet, chocolate doeling. Long and wide bodied with a gorgeous deer-like face & head! MiMi is my baby girl, just a melt your heart sweet little doe. She broke her front leg while out playing in mid April and was in a cast/splint for about 5 weeks. UPDATE: MiMi went in for additional x-rays to check the progress of her front leg/knee break, and it unfortuantely shows a new break to her shoulder probably broken when fighting to get out of her front leg cast last week. We are praying that she makes a good recovery. I am not willing to give up on this girl as I love her SO much! She is beyond thrilled to be "cast-less" now and is managing very well. I think she is much better without the cast than with the cast on... She was just fighting the cast too much. I am still very hopeful that she will freshen with a beautiful udder and still be able to show and appraise well. Darlin kidded with gorgeous twins in 2013! One boy, One girl! And they are STUNNING! The little doeling is a beautiful doe and will definitely be retained here. (**2014 Follow-up, Darlin's 2013 daughter - Bellafire Patty Cake - won her Champion Jr. Leg at the 2014 NWODGA Junior Doe Show! **) Darlin's First Freshening udder is beautiful! Initial (early) assessment of her udder shows nicely placed teats (although possibly not as large as her mothers), excellent udder texture, smooth foreudder, and super high rear udder! Unfortunately she won't be on milk test this year due to her very late kidding date...but her mom earned hers, and I'm sure Darlin will be following suit! 2014 Update - Darlin kidded with beautiful flashy triplets this year, 2014. Two doe's and a buck. All very refined and flashy. Darlin has also done VERY well in the show ring, always placing in the top of her class against very competitive goats! She has an incredibly high rear udder with beautiful definition of her udder halves and strong medial ligament. Probably the best in our herd for her strong medial!